An accident happens in seconds and is over. All that is left is the aftermath showing the results of the crash and the damage to people and vehicles. Even this is temporary. Emergency vehicles arrive on the scene to take care of injured people and get them to the hospital for medical help. Jaws of life and other emergency vehicles save lives but need to contaminate the accident site to do so. Police secure the scene and make their reports as quickly as possible. Tow trucks arrive to remove the broken vehicles and clean up crews get the roads back in working order so the traffic can get moving again. The reason for the accident and the way it occurred can be largely unknown. Accident reconstruction professionals heavily rely on eyewitness testimonies along with police and medical reports to piece together what happened, why and who was at fault. In a personal injury lawsuit, there are always conflicting views and opinions presented by opposing lawyers about what happened and who is at fault. Photos are difficult to argue with. They can help explain the accident and reveal acts of negligence that can support your claim. 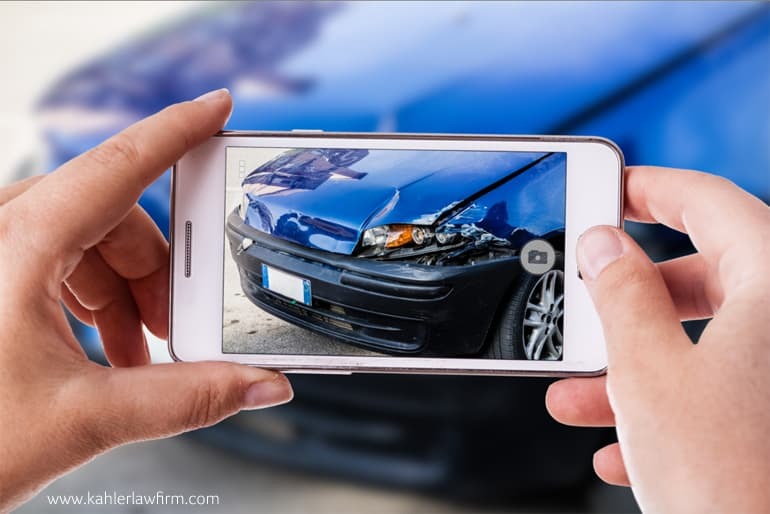 Quick thinking individuals who take photos before evidence disappears can provide the critical evidence required for seriously injured persons to get the financial support they need. Photos of the location can help investigators piece together possible contributing factors to the accident, such as: snow banks, faulty traffic lights, road traffic congestion, traffic signs, road construction, road surface condition, angles of view etc. Include images from all directions – facing north, south, east and west. Take photos of the entire accident scene showing the big picture view from a short distance away. Using the positions of vehicles relative to each other and surrounding landmarks can be helpful in assessing speed and the angle of impact. Keep in mind to take pictures from a variety of angles. Photograph scrapes or skids that can help determine speeds, direction of travel and impact points. Even though discrete details will be difficult to make out, the overall information is discernible to the trained eye of forensic investigators and accident recreation professionals. Car accident photos should show skid marks and road conditions including potholes, roads under construction, uneven pavement, wet or dry pavement, soft shoulders, slush, snow or ice. A snapshot records the point in time showing what the weather was like when the accident occurred, at what angle the sun was shining and whether the glare could have contributed to the accident in any way. While snow or ice covered windshields can be a contributing factor in a car accident, they are usually clear by the time, police or emergency personnel arrive. Weather in Southern Ontario is unpredictable. Dense fog, heavy rain, and winter white outs can last for moments or hours. Pictures taken immediately can help provide proof of fault. Take photos from an angle showing more than one side of the car at the time. Photos of vehicle damage should show the license plates of vehicles involved, if possible. Show damage to the vehicles and physical damage to surrounding structures such as bridges, buildings, mailboxes, trees, etc. Consider photographing tires, brakes lights, steering and signals. Include photos of broken glass and road debris, alcohol containers, gasoline spills, blood and other fragile evidence that can be is likely to be removed from the scene. Take photos of vehicle damage to the interior including sun visors, deployed air bags, debris, seat-belts and signs of drug or alcohol use. Photograph the condition of the other vehicles involved. Look for unsafe characteristics that may have existed before the accident (such as bald tires, poor visibility from frost snow or dirt or broken head lights). Darkness can make it considerably more difficult to photograph the car accident scene. By using a flash setting on your camera or phone; look to identify permanently fixed objects at the scene. Take numerous photographs in secession in attempt to gather usable imagery. If you can, have someone return to the scene the next day to capture whatever evidence they can. Take photos of people who have been injured as well as the ambulance or ambulance personnel who are taking care of them. Often good Samaritans stop to help, in an accident situation, then slip away, unrecognized, when professional help comes along. Take photos of passers by. These people often have first hand knowledge of the accident, that is lost if they are never questioned further. Photos make identifying potential witness easier, even if they are unavailable for questioning at the time of the accident. Photo evidence is often used, by the defence to show that the injured person is lying about the extent or seriousness of their injuries. Private detectives are hired by insurance companies to take pictures of plaintiff’s in an attempt to damage their reputation by showing that the injured person is faking their pain and disability because they were seen smiling in public. Even though the photos are misleading because they were taken out of context, they are a powerful form of evidence when used in court. These photos are routinely used to sway the opinions of jurors, who might be otherwise sympathetic to an injured plaintiff. Although many cases settle before trial, not all do. In situations where court is necessary, it may be up to 2 years before a plaintiff goes before a judge and jury. For some people, accident memories begin to fade and so do the visible signs of many injuries. For others the memories continue to replay themselves. The jury may find it hard to believe the testimony describing the accident and the injuries involved. The signs of multiple surgeries or skin grafts and long months of pain and discomfort are invisible. Photos taken at the accident site and ongoing during the healing process help make it real to the jury. Car accidents happen in an instant. People who were involved in even minor car accidents have a difficulty remembering everything that took place. Those who sustain head or other serious injuries may have no recollection at all. Memory loss can occur due to trauma and shock. There are many aspects to consider in how an accident occurs. No one who was in one of the vehicles during the crash could experience the occurrence from more than one perspective. To be eligible to receive benefits in a personal injury case, it must be proven there was a breach of duty by someone else. Photos taken immediately or shortly following an accident are a memory aid to people who remember part but not all of what happened. For people who lost someone due to wrongful death, or were seriously injured themselves, photos can provide the clue to what went wrong.